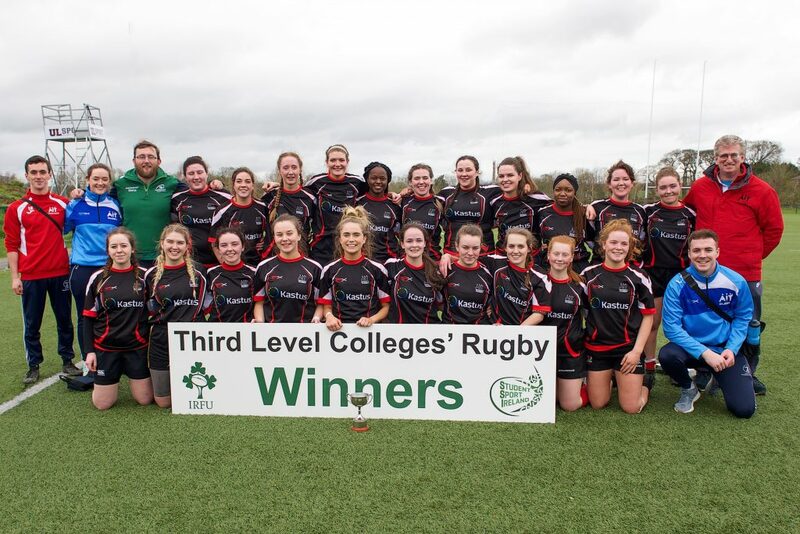 Athlone IT captured the first ever Student Sport Ireland / Irish Rugby Football Union Women’s Tier 2 Cup title when they had eight points to spare over University of Limerick ‘B’ on Wednesday March 20th on the 4G pitch in UL. Amanda McQuade scored an early try for Athlone IT but that was quickly cancelled out as Ellen O’Sullivan crossed for a pair of tries for University of Limerick and one conversion from Meadhbh Lewis had the Limerick side 12-5 in front. Cathriona Kielthy got AIT back in touch with a try as University of Limerick led 12-10 at the break. Athlone IT hit University of Limerick with three tries in succession to push into a 25-12 lead with the tries scored by Kara Collins, Rachel Tierney and Orla O’Donovan. Laura Sampson added a try before the end for University of Limerick but there was no denying the girls from the Midlands as they received the cup at the end. Athlone IT – Orlaith Plunkett, Catriona Kielthy, Yvonne Hedigan, Rachel Tierney, Ellen Connolly, Laura Keenan, Abbie Cullen, Beverley Kabaira, Niamh O’Dwyer, Amanda Hollingsworth, Jennie O’Reilly, Orlaith Foxe, Amanda McQuade, Della Daly, Kara Collins, Cathriona Heffernan, Elle Coen, Rebecce Wright, Sarah Browne, Orla O’Donovan, Tanya Orugbo, Emma Richardson. University of Limerick ‘B’ – Aoife Walshe, Deirdre O’Donnell, Cathriona Byrne, Laura Sampson, Mary Power, Aoife O’Grady, Michelle O’Driscoll, Meadhbh Lewis, Ellen O’Sullivan, Erin Grace, Sinead O’Reilly, Ashlyn Fong, Emma Helen, Lynn Fenton, Aoife Bowman, Mairead O’Sullivan, Daimhlin Darling, Abby Corbett, Mari Ju, Mary Lambert.